"All novels are spy novels, as all writers are spies." Ian McEwan does brilliant openings. Sweet Tooth is no exception. Serena Frome, a bishop's daughter, was sent on a secret mission 40 years ago, and it ended badly. A history tutor at Cambridge recruits her as a spy for MI5. The plan is for Serena to pose as the representative of a cultural foundation and reel in a novelist. The young writer's name is Tom Haley, but it might as well be Ian McEwan. Haley's debut as a writer now takes centre-stage in the novel, with Serena chronicling his literary tastes and habits, his reactions to his own growing success, his early encounters with Martin Amis, Ian Hamilton, Tom Maschler, and so on. McEwan seems to be enjoying the trip down memory lane, sketching his old pals and their hangouts with nostalgic affection. It's all fairly good fun. In 1972, Serena Frome graduates from Cambridge with a third in mathematics. She attracts the attention of Tony Canning, a former MI5 operative. The two become lovers. Canning is grooming Serena for MI5. 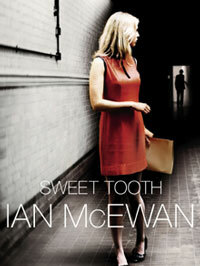 She accepts a honeytrap mission: Sweet Tooth establishes a foundation to promote the work of young writers whose work is openly critical of communism. Tom Haley is selected. Even before she meets Tom, Serena is smitten by his fiction. The pair fall in love, all paid for by the foundation. McEwan works in pastiches of his first publisher Tom Maschler, mentor Ian Hamilton, and friend Martin Amis. Forget the spy charade: this is a book about writing, wordplay, and knowingness. Serena Frome is a beautiful blonde Oxbridge graduate who is recruited to MI6 in the 1970s and sent on a secret mission. She is sent to recruit a promising young writer, Tom Haley, with the offer of an annual stipend. Sweet Tooth takes the expectations and tropes of the Cold War thriller and ratchets up the suspense, while turning it into something else. What you see is not what you get, with a twist at the end. The publisher Tom Maschler and the authors Ian Hamilton and Martin Amis all appear in the story. The psychological and period details build up, convincing us of veracity before jerking the rug away. This is his best book since Atonement.